I spent the last two weeks in Paris The highlight of my trip was the return to the Rodin sculpture garden. This time I was able to go alone and not be hurried along or annoyed by others, though a cat did bite me while I was eating lunch there. The statues are incredible, and I developed a new love for "The Burgers of Calais," six noblemen sacrificing themselves for their town. Rodin was pretty great, and he had a really young sculpting mistress. It’s nice Rodin.The low point was the Louvre. The outside of the Louvre is incredible. The inside is repellant. I like pop tarts, but I wouldn't ever want to eat 40,000 of them at one setting. So goes the Louvre. American TV and movies have been blamed for desensitizing people to violence. The Lourve does the same for art. Oh, hey, there's the Mona Lisa. David's (pronounced as if you are a part of the cross dressing French) large paintings and Michealangelo's captives were the highlights of this garage sale from hell. Dinner at the Hollywood Savoy was a treat - including having several people from our table forced to dance up on the bar because it was their "birthday". One night we visited "Le Bain Douche", which I think means something no one should try at home. Since they don't serve decent beer in the whole country, I was stuck drinking Black Russians, which then prompted me to try talking to a 19 year old with a butterfly pin in her hair. 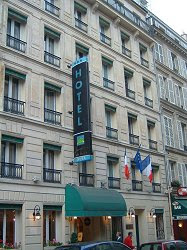 I stayed in the Jardins de Paris Morny Saint Lazare Hotel near the Jardin de Luxembourg, a cool park where old men plated Bocchi ball, and everything else in the world went on. All this traveling made me forget about my objective “make some money with my bloging”, it’s time to get back in action. oui oui !! it's hard being in paris !! muchas gracias por pasar a visitarme en mi rincon..